Supplies the most unique blooms that I have seen. Appear to look like tiny eyes. Really surprised at how well these plants are doing. Love the blooms. These plants look so cool mixed in with my wildflowers!! Baneberry Plant can be created with oils by a herbalist and used to treat irregularity of menstrual cycles and also cramps and pains. This plant is also used to help with coughs and the common cold. It was used by the American Indians to treat these and also used for circulation problems and headaches. This herb needs to be used under the care of a herbalist or a doctor to make sure that the ingredients are right for the medicinal problem. The White Baneberry is a favorite perennial often used to attract birds, particularly upland game birds, to one's home or garden. The Baneberry plant produces berries after its flowering season which are bright white and highly visible, and are a food source to many different types of birds. However, these berries (and the plant itself) are quite poisonous to people, and should not be planted in an area where small children have access to them without supervision. 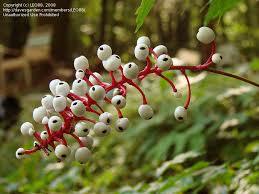 The bright white berries also appear to be little eyes that are watching over things. It usually blooms in July and August and looks bright and adds lots of colors and a very natural feel to all gardens. It thrives when planted in moist and well-drained soils and also in full. This plant can also be found growing in the wild in wooded areas that are moist and shaded. 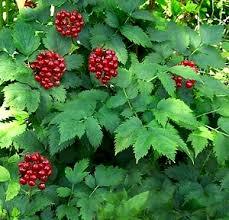 Baneberry Plant is an excellent addition to all gardens and natural areas and is very easy to grow.